Farmers from Creighton, Ixopo and Donnybrook, known as the “milk-bowl” of KwaZulu-Natal because of the high quantities of milk produced in the area, have rallied together to protect community and consumer interests following a labour dispute between Clover/ Dairy Farmers South Africa (DFSA) and their drivers which halted the transportation of milk in the area last week. With very little notice that transportation of their milk would not be available for at least a 48-hour period, and realising the financial and environmental impact this would have on the farming community at large, farmers immediately took matters into their own hands. A temporary ‘depot’, consisting of a gazebo, desk and a couple of chairs, was erected by Macston Dairy farmers Craig Macfarlane and Darran Stone at Loch Buighe dairy in Ixopo. Local unemployed drivers arrived at the makeshift depot where they were vetted and given a course on how to run the pumps on the trucks. Together with farmers and their employees, they took over the driving and management of the milk pumps. 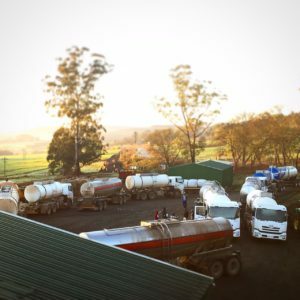 This depot became the central facilitation point for the transportation of around 800 000 litres of milk a day across Southern KZN – running 24 hours a day, over four days, from Tuesday 26th to Friday 29th September, ensuring the end consumer would not be short of milk in their local store. “Without transportation, farmers would have been forced to dump their milk,” explained Stone. “This would not just have resulted in a financial loss to the farmer but would have been an ecological disaster as milk is a known environmental pollutant and on such a scale it would have been extremely difficult to get rid of,” he said. Botha credited the “insignificant volumes” of raw milk that were lost over the four days to the “major role” milk producers played in the transportation of milk.